Many of us have found ourselves in a situation on a camping trip where there is not enough sleeping space! This can be an annoying situation to deal with, and can actually ruin a great camping trip if some people are left without adequate sleeping area and comfort. In a hurry? Check Out Double Camping Cots at Amazon! Thankfully, there are some great product solutions to this kind of problem, and they come in the form of the best double cots! 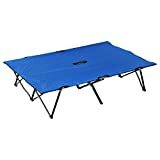 This type of double camping cot is a fantastic product to have on a camping trip if you are going to be camping as a couple, with friends, family, or anyone else who will need a space to sleep. For couples, this type of two-person camping cot is an excellent product to have on a camping trip since it will allow you to share a bed with your significant other! This buyer’s guide will seek to provide helpful information about the cots for two people and will present some of the product options in this category! The Coleman Airbed Cot – Queen Size is an exceptionally high-quality 2 person cot, and with its premium quality comes a bit higher price tag as well. For many people, the great quality of this product will be worth the higher price tag since there are a lot of impressive features on this double cot. Featuring a proprietary Comfort Strong coil system, this double cot provides unparalleled support for a great night of sleep. For convenience, there are two side tables with cup holders built into this cot which is a great feature to have for improving the overall comfort of your camping trip. The frame on this cot by Coleman is built from durable steel, which dramatically improves the lifespan of this cot. It also comes with a 22” high air-mattress that includes a 4D battery powered pump to quickly inflate and deflate the queen size airbed that comes along with the cot. Kamp-Rite is a camping equipment company that has developed some impressive cots. Their premier double camping cot is called the Tent Cot Double Kwik-Cot, and this is an affordable product that offers mid-level quality. This product will definitely get the job done, and will work well for people on a budget too! With a frame made out of sturdy metal and a black fabric cot surface, this is a good looking cot that will work well in any environment. Weighing in at about 35 pounds, this double cot certainly weighs a fair amount, but that is a good thing since it makes the cot more durable and damage resistant. 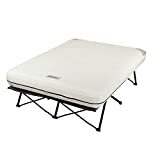 It provides an 85″ x 55” sleeping surface when full setup, and it is capable of supporting up to 550 pounds. The 76″ Two-Person Double Wide Folding Camping Cot by Outsunny is definitely going to be the perfect product choice for campers who only want the cot frame without any airbed included. Outsunny has outdone themselves with this 2 person camping cot, in terms of appearance, durability, and affordability. With a bright blue cot surface material, this is also the most vibrant and attractive looking double camping cot on the countdown as well. It uses a damage resistant 600D PVC oxford fabric for the cot surface, which is especially tear-resistant and mold-resistant too. This 2 person cot can accommodate 440 pounds of weight and uses a powder-coated steel frame that will last a long time. Portability is also great (24.2 lbs weight) with this cot by Outsunny since it folds easily and comes with a travel bag for easy carrying in and out of campsites. For an exceptionally durable and effortlessly portable cot, check out this folding cot by KingCamp. 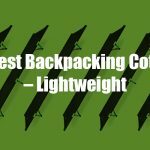 It also has one of the best industry weight limit for double camping cots of 550 pounds, making this a great choice for larger individuals. This cot is also extra-large, providing an 84.6” x 55” sleeping surface that can comfortably accommodate two people with some room left to spare. Even with the extra space and high weight limit of 550 pounds, this cot is still at a fairly low weight at only 35 pounds fully folded and collapsed! Portability is one of the most impressive features on this double cot by KingCamp since it comes with a carrying bag that is equipped with easy-rolling wheels on the bottom! 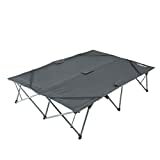 One of the best extra wide camping cots is the Teton Sports Outfitter XXL Camping Cot, and this product provides great value for the money. This cot uses a patented steel S-Leg frame design that gives it a tremendous weight capacity. With one of the highest weight capacities of any double camping cot being sold today, this model from Teton Sports boasts an incredible 600-pound capacity. Channeled aluminum support bars also improve stability and durability over time, and coupled with a sturdy canvas material for the main surface, this cot is sure to last a long time. Even if something does fail on the cot, Teton Sports offers a Limited Lifetime Warranty for the equipment! This cot is so comfortable, you might not only use it for camping but as a spare bed for guests when they visit your home! For campers who want a double camping cot that has a built in a tent, there are few better options than the Kamp-Rite Double TentCot! This product is different from the other conventional double tent cots we have presented so far, mainly because of the integrated tent. Interested in more 2 person cot options? See our full review of best double tent cots and best double sleeping pads. This integrated tent feature is awesome since it guarantees that you will not run into the problem of being unable to fit your cot inside of a preferred tent. It also provides a perfect environment for sleeping within and can block the wind, rain, and elements while you are sleeping. A quality tent can cost quite a bit of money, so being able to combine the double cot with a tent can achieve two objectives at one time. To complete any great cot set up, you are going to need a high-quality double sleeping bag to bring it all together! It offers tons of color options, ranging from Grey, Blue, Brown, Orange, Teal, and more. Featuring a brushed flannel lining, this sleeping bag will keep campers warm even in extremely cold conditions. If it happens to warm up a bit, it also has ventilation zippers, ensuring that users don’t ever get too hot or too cold. The Limited Lifetime Warranty is another attractive aspect of this product, with Teton Sports fully standing behind their craftsmanship. The Queen Size XL by Sleepingo is a perfect addition to any double camping cot, and it is extremely well-reviewed by almost every customer who has purchased it. The internal lining of this bag uses a blend of cotton and tetron fibers to achieve an extra warm and cozy feeling. With its massive size of 87” x 59”, this sleeping bag not only fits two people but fits them comfortably with some room to spare. Although not quite as cold resistant as the bag from Teton Sports, this bag from Sleepingo will be effective all the way down to freezing temperatures around 30 degrees (F). How Do You Even Choose 2 Person Cot? Choosing a camping cot for two people can make a world of difference for your next camping trip! Choosing the right option for your needs can be a somewhat difficult challenge since there are many different product options, but this buyer’s guide will help to narrow the choices down to only the best options that provide the optimal value for the money. Step #1 – Determine your budget. Step #2 – Decide what you want your cot to look like; do you want something all black or with bright colors? Step #3 – Decide what kind of materials you want your double cot to be made from; plastics and cheap metal will save you money, but better materials like steel and aluminum will be stronger and more durable. Step #4 – Decide whether you want your double wide camping cot to come with an airbed mattress, or if you want one that has only the frame and surface with no mattress. Step #5 – If you will be using a double sleeping bag, make sure the size of your sleeping bag will work well with the size of the cot you want.